Who needs many tools to prepare food? 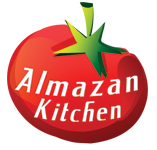 Certainly, some TV fancy stars, but AlmazanKitchen says NO to the modern cooking! We stay close with our Mother Nature! We use only organic ingredients and all of our dishes made from scratch. In this video and topic, (you can check it on our website) we will show you how to make incredibly flavourish and spicy pork fillet on the improvised spit over fire in the forest! For garnish, we prepared marvelous pasta using only few ingredients! Such juicy and extremely awesome dish, you certainly do not want to miss it! Mix 1 hand of flour with 1 egg and 1 tsp. of salt. Knead well, form a ball and leave to rest. Coat well 1kg of pork fillet in handful of sumac, tahini, 1tbsp. of black salt, and 1tbsp. of rice vinegar. Leave to marinade in cool place for a while. Skewer up marinated pork fillet onto fresh made spit, place near the fire and cook neat the fire for 30-40 min (482 F°/250 C°). Do not forget to spin it constantly! Unpeel, smash and chop one garlic clove, slice handful of small tomatoes, toss everything + macaroni + handful of baby spinach into the pan. Cook constantly stirring for 5-10 min. Add sauce left after marinating meat. (842 F°/450 C°). Enjoy! Yea, use your hands do not be shy!